Logic Hop provides a variety of options for easily adding Conditions and Goals to WordPress pages and posts. The Logic Hop Page/Post Tool is available within the WordPress page and post editors, located beneath the content editor. Note: If you are using Gutenberg, the Logic Hop Page/Post Tool and Logic Hop Tool Palette will not be available within your editor. Read more about Logic Hop with Gutenberg. The Lead Scores setting determines if a Lead Score is incremented when the page or post is loaded. Learn more about Lead Scores. To set a goal on page load, select a goal from the Set Goal on Page Load select menu and publish or update the page/post. The goal will be set every time the page is loaded. 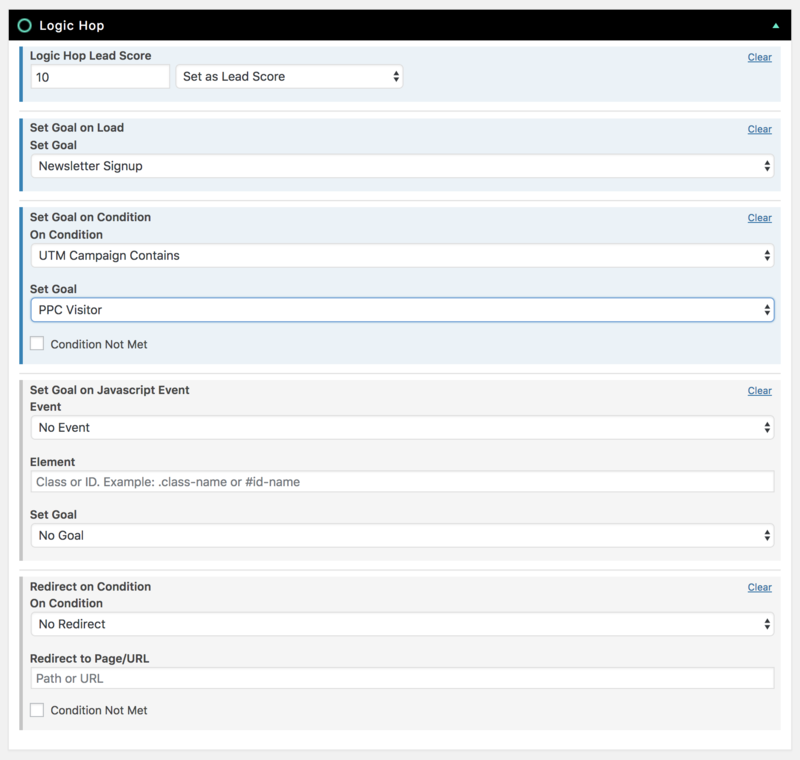 To set a goal on page load when a condition is met, select a condition and goal from the Set Goal on Condition select menus and publish or update the page/post. The goal will be set each time the page is loaded and the condition is met. To set a goal on page load when a condition is not met, click the Condition Not Met checkbox. CSS classes and IDs must include the “.” or “#” prefix. Multiple CSS classes and/or IDs can be entered if separated by commas. To redirect users to a different page when a condition is met, select a condition from the Redirect Page on Condition select menu and enter a URL in the Redirect to Page/URL field, then publish or update the page/post. Redirects are performed using the WordPress wp_redirect(); function and issued with a 302 status code. To redirect users when a condition is not met, click the Condition Not Met checkbox. The settings depicted above would redirect a user to the page /friday-deals on the current website when the Today is Friday condition was evaluated as true. Note: For Internal Redirects, redirecting to pages on the current website, either use the full URL, or specify the relative path to the page starting with a forward slash. The settings depicted above would redirect a user to the external website https://logichop.com when the Today is Friday condition is evaluated as true.